I am posting this mainly because this was something I was unable to find in other resources. I hope it will be helpful for you! 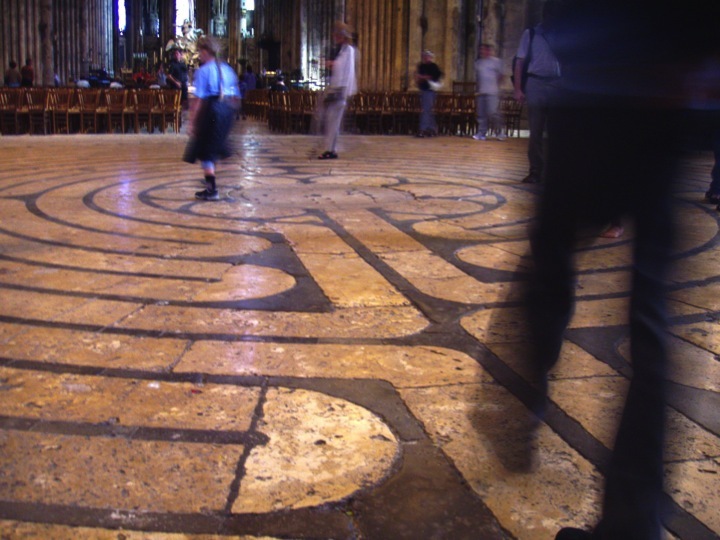 Labyrinth, a maze where you never get lost: For hundreds of years people have been walking labyrinths as a way of focusing on how God walks with them. Some people use the different parts of the path to be different parts of prayer. Walking towards the middle can be like walking towards God’s presence. You can use this time for confessing things you’ve done wrong. When you get to the middle you can use that time to thank God for all the blessings in your life. When you’re walking out of the middle back to the beginning you can pray about how you will share God’s love with other people in the world. We lifted up our own confessions, thanksgivings, and prayers for others. 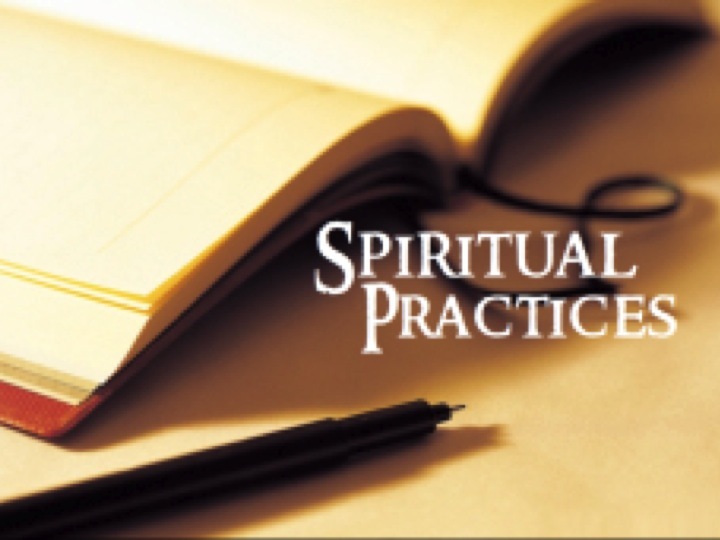 We are now about halfway through our Lenten series on Spiritual Practices. So far we have discussed iconography, seeking God’s presence in this world; fasting, hungering for God’s will; and prayers of petition, crying out to God from our helplessness. Today we are continuing on with another practice: traveling a labyrinth. 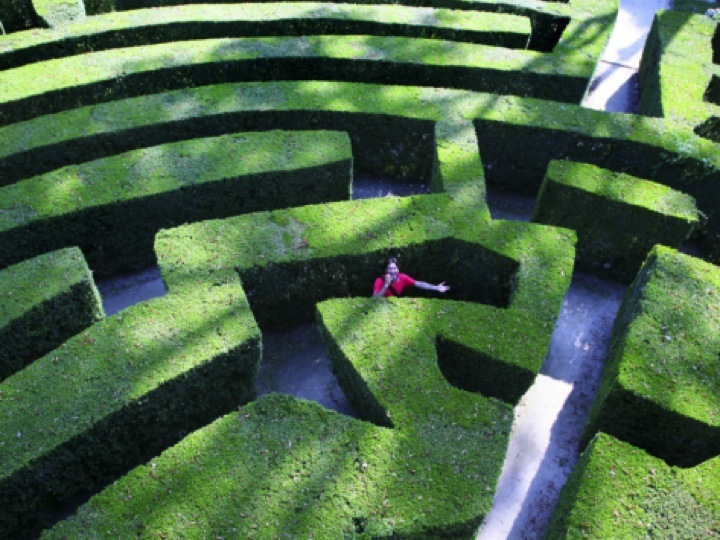 Many labyrinths are outdoors: constructed of rocks on the ground, the way grass is cut, or in hedges. 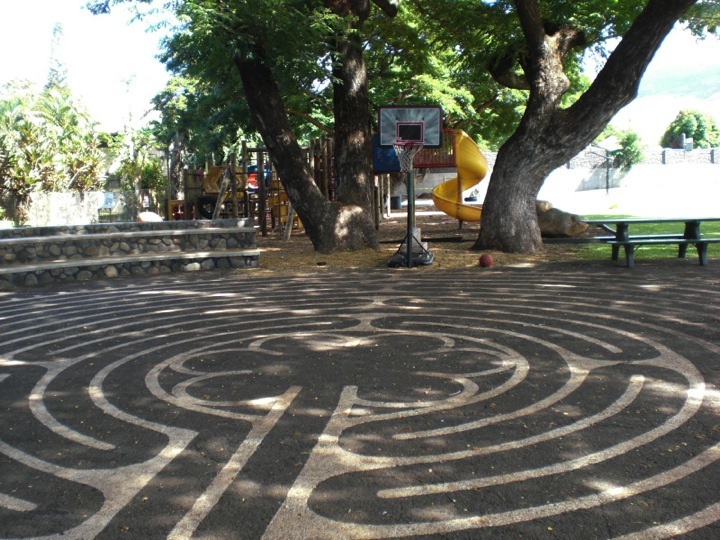 Some outdoor labyrinths are made of paint on pavement. There are labyrinths laid out in the stone, marble, or carpeted floors of churches all over the world. There are also fabric labyrinths that you can rent and lay out a floor. Any church with pews can be walked as a labyrinth, winding in and out of the pews and back up the aisle. A familiar neighborhood can also be walked as a labyrinth as long as your don’t get lost. There are also smaller labyrinths, such as the ones you have in front of you that can be traced with your fingers or even followed with your eyes. There are labyrinths nearby in the Cedar Valley Arboretum, at St Luke’s Episcopal in Cedar Falls, and at Camp Wyoming. When I was in seminary I took a class during my first year called “Spiritual Formation.” In our class we worked through different prayer practices. One of these practices was, as you might have guessed, praying through the labyrinth. 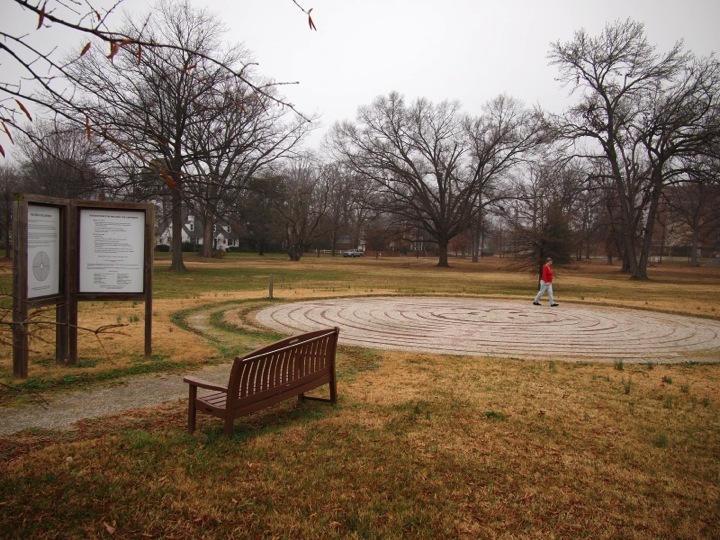 At Union Presbyterian Seminary we had a labyrinth on the edge of campus out behind the campus apartments that was made with stones in the ground, so that you couldn’t really see it until you were right up at it. For my class assignment, I went to the labyrinth and walked the path. I was angry. I was annoyed. I felt let down by my own inability to be meditative. As others in the class shared how they had enjoyed themselves in their labyrinth walking, I was jealous. Why couldn’t I experience God in that way? 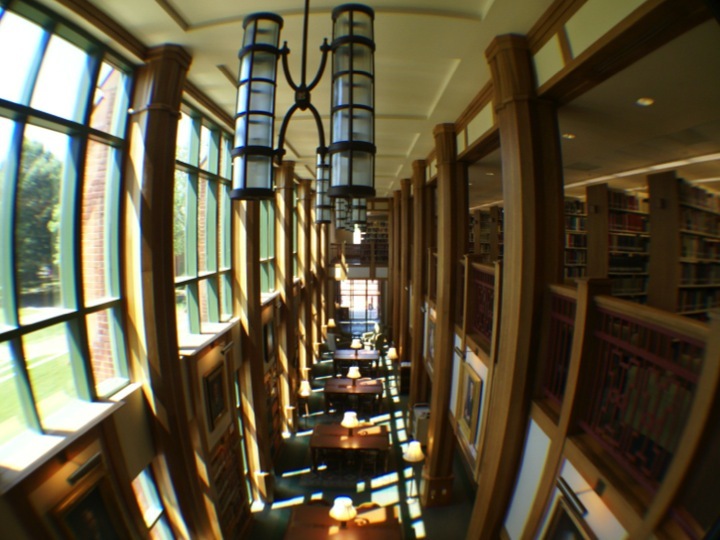 When I left class that day I went into work at the seminary library where I worked the desk and shelved books. There was a full cart of books to be sorted, a challenge that I enjoyed; creating order out of what was sometimes chaos. 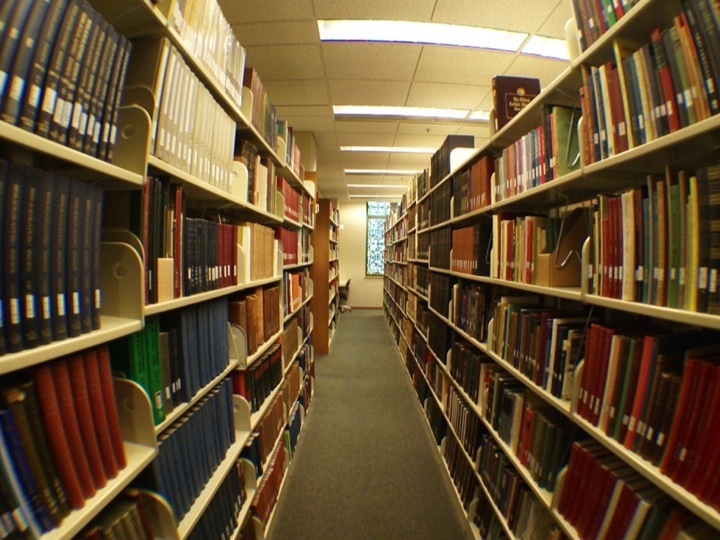 And then, I took those books around the building to the stacks, going up and down the aisles making sure things were straightened up, and placing the books from the carts on the shelves where they belonged. Though this task was mundane, it also brought a lot of peace. I did my best thinking as I was walking down around those books. About halfway through shelving books I stopped myself right in an aisle and nearly laughed out loud. An hour ago I had been complaining about walking a labyrinth. Complaining about having to walk around in that patterned path. And now, here I was walking another patterned path and I loved it. I felt God’s presence around me. I prayed prayers, talked to God, and was able to clear my mind and reach that transcendence I was trying so hard for in that labyrinth path. God had already been working through me in a labyrinth practice and I hadn’t noticed. It’s a funny thing to be in a school where you are being trained to think theologically and to stumble quite by accident into the very spiritual practice you’ve been resisting. God certainly has a sense of humor. When we seek to follow God in our lives and fully place our trust in God’s direction we are often led in ways we could never expect. Labyrinths are a place where we are forced to trust that we will end up where we need to be. As we allow God to lead us in our daily lives we are transformed. Following God in the labyrinths of our lives takes us to a place of wilderness, but with God as our focus it is also a place of hope and transformation. In the desert, the people of Israel were transformed into the children of God. Jesus went into the wilderness in the forty days before his crucifixion, was tested and tempted by the devil, and came out on the other side fortified for the horrors of his atoning death. “So if you think you are standing, watch out that you do not fall. No testing has overtaken you that is not common to everyone. God is faithful, and he will not let you be tested beyond your strength, but with the testing he will also provide the way out so that you may be able to endure it.” (1 Corinthians 10:12-13) In our labyrinth experiences, there is always a way out, and God desires to lead us through it. At first glance a labyrinth looks like a maze: twists and turns on a defined path. The difference is, while one can pick the wrong direction in a maze and become lost, the path of a labyrinth never branches off. 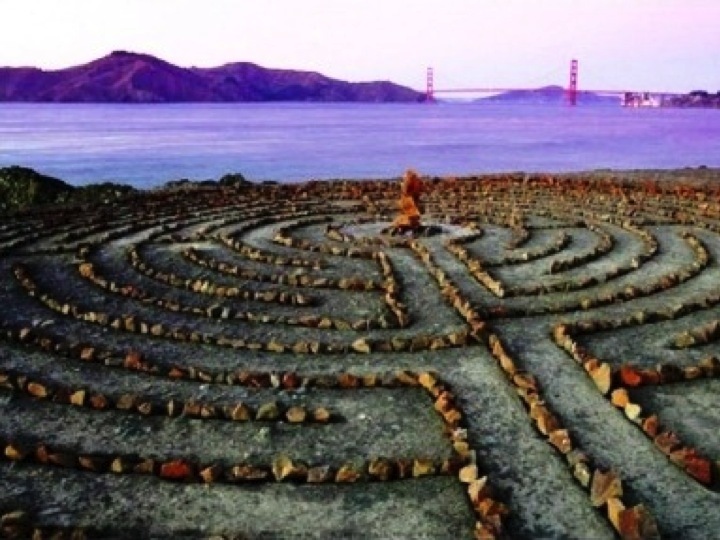 While in the labyrinth you might be confused by the twists and turns of the path, as you are getting closer to the center it may suddenly take you back right by where you started. But if you keep moving forward along the path, you will always make your way to the center, and will always make your way back out again. So what are we supposed to do as we walk a labyrinth, or trace one with our fingers? Some recommend praying through the Lord’s Prayer, the Apostle’s Creed, or any other familiar prayers. However, I think the danger with any sort of prayer practice is we become convinced that our experience needs to look a certain way, or feel a certain way, and we close ourselves off to the outcome that God intends from our circumstance. For some, having a checklist of prayers to run through can seem like another distraction. Allow yourself to pray whatever you need to pray, and to be comfortable with silence. 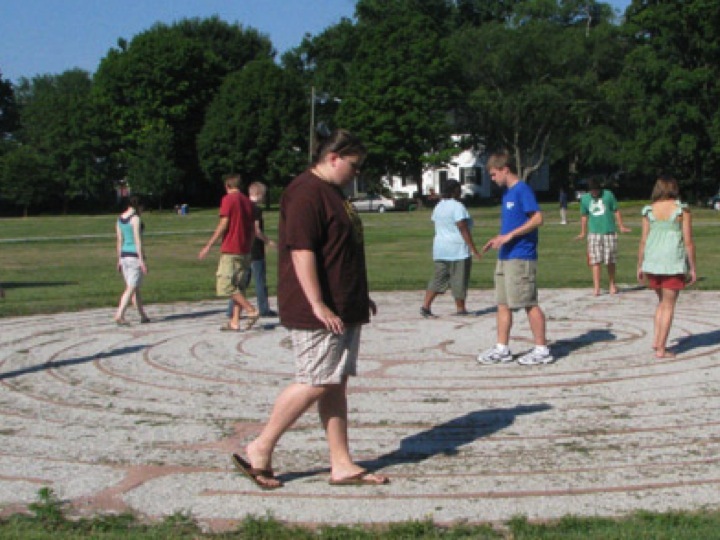 One of my favorite prayer suggestions was by author and labyrinth expert Jill Geffrion who suggests to simply pray “Your will be done,” at the beginning of the labyrinth, and then walk with intentionality to your own movement and pace. 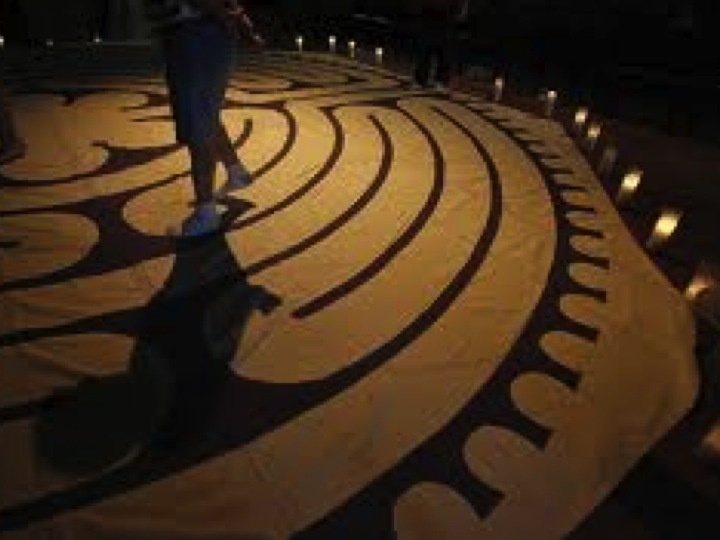 This Lenten season I would like you to try a labyrinth practice. Allow God to work through the winding paths, to provide wisdom and clarity in the silence. I would also like you to open yourself to the purpose of this practice: allowing prayer to be rise out of movement, allowing meditation to surface in the seemingly mundane tasks of your everyday life. 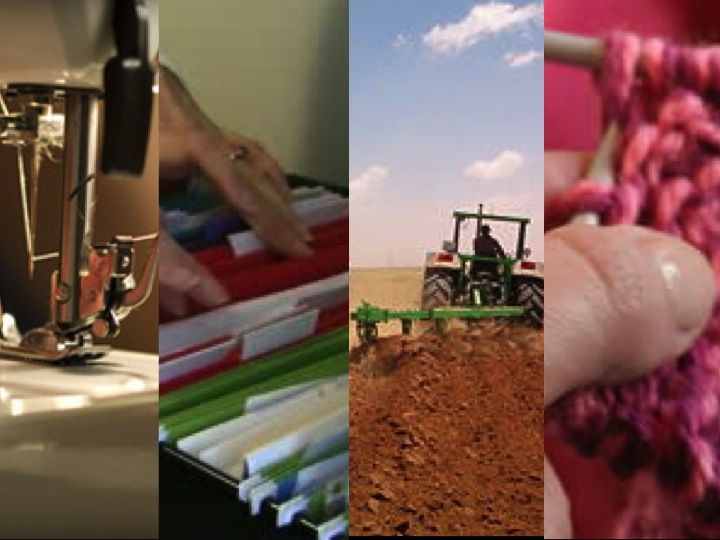 This may happen for you in the piecing together and sewing of a quilt, in filing files in an office, perhaps in plowing rows in a field, or as I often find it, in knitting. These patterns of your life can be adopted into labyrinth prayer practices. As you work through these activities pay attention to your movement, quiet your mind, and see what God may be saying to you. Remember Paul’s urging to the community at Corinth, traveling through life’s path is requires trust in God. This Lenten season, may we move forward as God leads us. Amen. Teresa A. Blythe, 50 Ways to Pray: Practices from Many Traditions and Times (Nashville: Abingdon Press, 2006), 92-93. This entry was posted in Children's Message, First Presbyterian Church of Jesup, Sermonizing, Spiritual Practices and tagged 1 Corinthians 10, 50 Ways to Pray, Apostles Creed, Bishop of Reading, books, Camp Wyoming, Cedar Valley Arboretum, children's explanation of labyrinth, children's labyrinth, cIsaiah 55, cloth labyrinth, confession, crucifixion, devil, explanation of labyrinth for children, filing, FPC Jesup, frustration, God Along the Way, God's direction, Hope, illumination, Isaiah 55, Israelites, Jill Geffrion, journey, knitting, labyriinth for children, labyrinth, labyrinth handout for children, led, Lent, library, Lord's Prayer, maze, maze vs labyrinth, meditation, mundane, my ways are not your ways, neighborhood labyrinth, path, pathway, petition, pew labyrinth, plowing rows, Prayer, prayer practices, Project Burning Bush, quilt, rock labyrinth, Sally Welch, shelves, shelving books, Spiritual Disciplines, Spiritual Formation, St Luke's Cedar Falls, St Luke's Episcopal, Stephen Cottrell, Teresa Blythe, thanksgiving, transcendance, transformation, trust, Union Presbyterian Seminary, Walking the Labyrinth, way out, wilderness, William Smith Morton Library, WSML, Your will be done. Bookmark the permalink.